Last month I lost my keys. That didn’t bother me nearly as much as not having my most-used naturalist’s tool readily available. 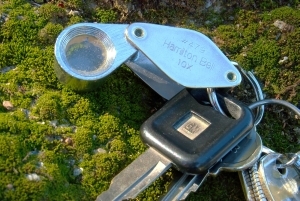 On my key ring I have a small ten-power magnifying glass. When I’m outside I usually have my binoculars, I often have a camera, but I always have my keys and a way to examine whatever catches my attention. I think that particular magnifier has probably traveled in my pants pocket for at least 25 years. What can you do with a magnifying glass? Have you ever seen the delicate hooks that hold a bird’s feather in it’s streamlined shape? Or tried to figure out how a tiny tree frog manages to stick to the outside of a sliding glass door?